Houstonians have a new transportation option. BOSTON and HOUSTON, March 26, 2014 Beginning today, 25 Zipcars are available by the hour or by the day for residents, students, businesses and visitors in the city of Houston. 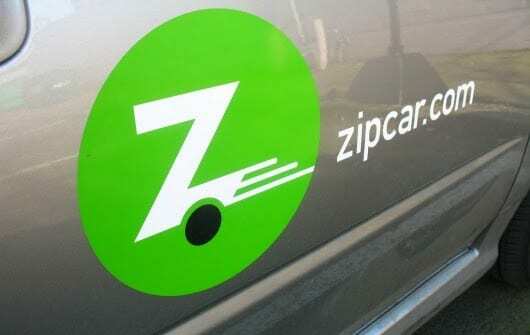 Zipcar’s revolutionary “wheels when you want them” service offers a wide variety of vehicles, from MINI Coopers to pickup trucks, and includes gas, a reserved parking spot, insurance, and 180 miles per day, making it a great option for those looking for convenient and cost-effective transportation. The launch, which makes Houston the company’s 27(th) major metropolitan area, will be supported by a retail office where members can interact with a local team. This is a most welcome entrant to the Houston market. As more people discover public transportation, cycling and walking, traditional car ownership seems less and less a necessity to get around the Bayou City. Zipcar is a great alternative for those who don’t need a car every day, but need more flexibility than renting for a full day or an extended road trip. Here’s hoping that the service catches on. Off the Kuff has more. As was stated in an earlier post, Texas Democrats are facing some rather long odds to win statewide in this election cycle. Most of this has to do with the long shadow cast by 2 decades of losses for the statewide party. 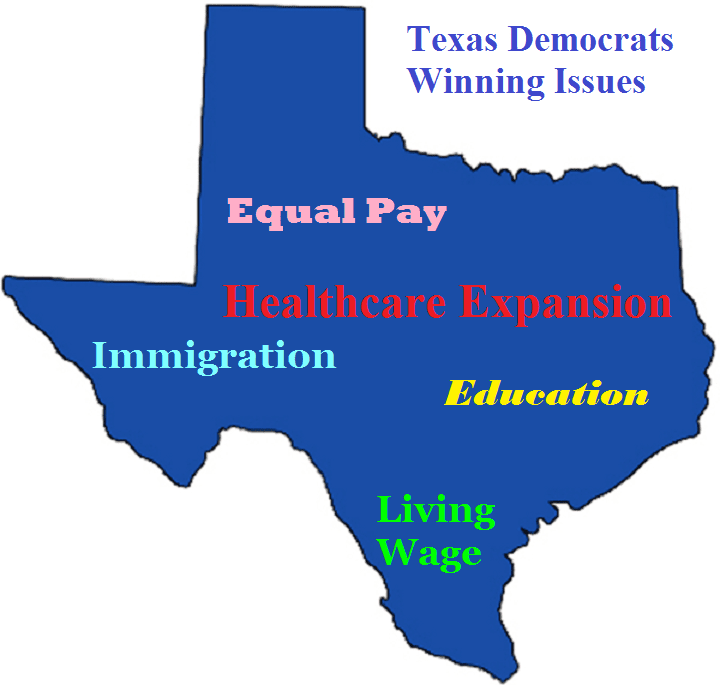 To put it simply, Texas Democrats have to start our game way downfield from the GOP. Aside from meticulously gerrymandered Congressional and legislative seats, the Democrats will be out-numbered on the ground and out-spent everywhere else. 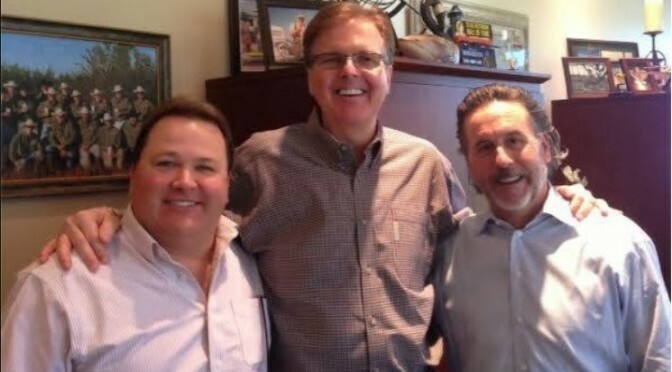 This is the reality of 2014 politics in Texas. The only way for Democrats to catch up is to formulate a true Texas message, force the issues, go on the offensive, and hit the GOP hard. Since the Primary election, it appears that this message is starting to be heard by the Davis campaign. After a somewhat rocky start, Wendy Davis’ organization has launched an all-out assault on Abbott’s stance over the issue of equal pay for women and minorities. “This Texas gal is calling you out,” declared the Fort Worth Democrat to huge applause on an issue that has energized her campaign for the governorship since the March 4 primary. Davis faulted Abbott for successfully fighting a 2011 pay discrimination case in court — albeit one based on race and nationality and not gender — and presiding over an office which, according to a recent report in the San Antonio Express-News, most female assistant attorneys general make less on average than men do in the same job. This is a good start for Davis, and will hopefully provide an example for Leticia Van de Putte, Steve Brown and other statewide Democrats to follow. Any successful campaign in the Lone Star state has to be about issues that resonate with people. Texas is not New York or Los Angeles. We’re not the same type of stereotypical “Liberals” that you find on the East or West Coast. Nor are we the other major part of the Democratic Party… Union-workers like you’d find in Ohio or Michigan. There’s not a large “Democratic Party” identity here. If anything, most Texans would tell you that they are Conservative just because that is what they know and understand. But if you dig a little deeper, and connect with issues they care about– safe schools, fixing roads and bridges, access to fair wages and upward economic mobility, health care for their families– the wellspring of commonality is revealed. For Democrats, the key winning strategy simply about pealing back the layers to find the areas where most voters agree. Equal pay has gained some traction, but the bigger issues like Healthcare expansion for the poor (via the ACA’s Medicaid expansion or otherwise) are out there waiting to be brought to the light. Along with forcing specific issues, it’s also time for Democrats to call for general election debates. In 2010, Rick Perry was able to get reelected without ever facing Democratic challenger Bill White on the debate stage. As a result, many voters (especially those in a last-minute rush to get informed before going to the ballot box) probably didn’t have sufficient information to consider Bill White a credible alternative. Debates are not only important for the moment they happen, but in the world of online search, they can also prove to be a critical resource for low-information voters. We can’t afford for the GOP to go under the radar like they did in 2010. Texans deserve to hear both sides of the political spectrum, and they deserve to have that information in a face-to-face debate. It’s one thing to toggle back and forth with the press, but having candidates on the debate stage can literally make or break a campaign. This must be demanded by Democrats, otherwise it’s not going to happen. Even in the face of disadvantage, it appears to have been a good month for Wendy Davis. As she and other Texas Democrats move into the next stage, it’s imperative that the keep the momentum going, and continue to pressure their Republican counterparts. Democrats are definitely the underdogs in 2014, but they can win as long as they’ve got plenty to bark about. Earlier this week I was privileged to meet with the team behind this project, known as Texas Central Railway. Sitting down with TCR President and Former Harris County Judge Robert Eckels, David Benzion and David Hagy, I was able to hear first-hand just how close the TCR is to becoming a reality. 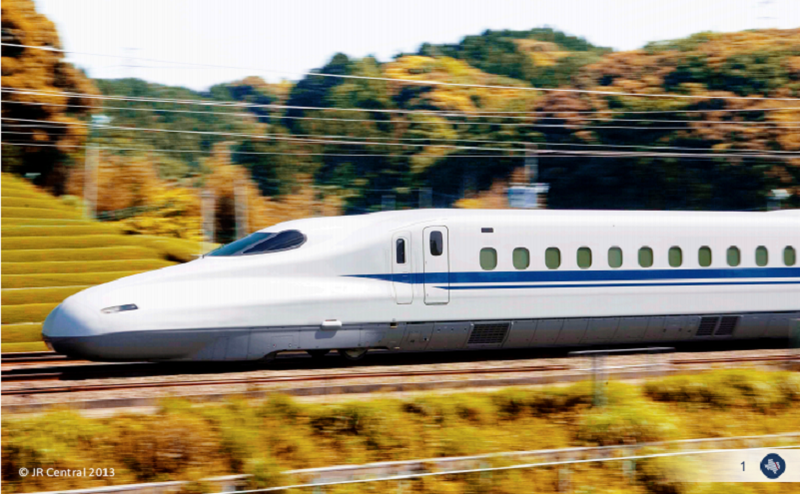 Unlike prospects in California or on the East Coast, TCR believes that that a privately-funded High-Speed rail network can be operational before anywhere else in the country. Now this is certainly not to say that private investment is always the way to go, or that it will work for every HSR corridor. But in Texas, this route has a particular appeal. 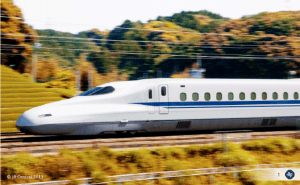 Unlike building freeways, the High-Speed Rail is less disruptive. It takes less space and by following already established freight rail corridors, would require far less land and property acquisitions. TCR will still have to obtain eminent domain authority, but they hope to use it as little as possible. Another reason for a potential “fast track” in Texas is simply the topography of the land between Dallas and Houston. Construction costs are going to be lower than they would in California because builders face fewer natural impediments (mountain ranges, protection from earthquakes, etc.). Building time for the line would be shorter as well, with some estimates saying HSR could be constructed in as little as 3 years. Of course construction is dependent on a number of additional factors, so there’s no specific timeline just yet. But another important concern here is safety. Private projects are almost always done faster than government, but that’s because government tends to put people over profits. If this line is built in record time with exclusively private dollars, how does TCR plan to ensure Texans that it is safe to ride, and not just a major accident waiting to happen? “Federal and state regulators have been involved in this project since day one. Though privately funded, TCR will be regulated by the Federal Railroad Administration, just as if it were a public project.” Eckels said. Co-designers of the Texas Project would be JR Central out of Japan, which has an impeccable safety record… no fatalities in almost 50 years of operation. 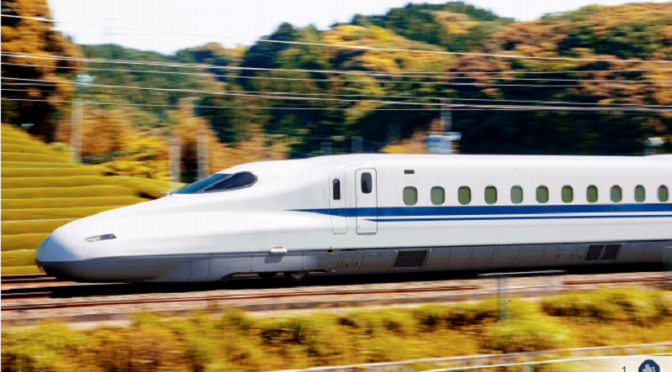 There are still many steps that need to be taken before Texas High-Speed Rail is a reality. But with the creation of TCR and other recent developments, it seems much more likely than it did a few years ago. Texas is in dire need of additional transportation options, and the TCR is off to a good start. As noted in a previous post, Houston transit ridership has been experiencing some significant growth over the past year. More residents of the Bayou City have discovered the Mass Transit system, and are using bus services throughout the city. As transit usage grows, so too does the expectation of safe, predictable and reliable service. 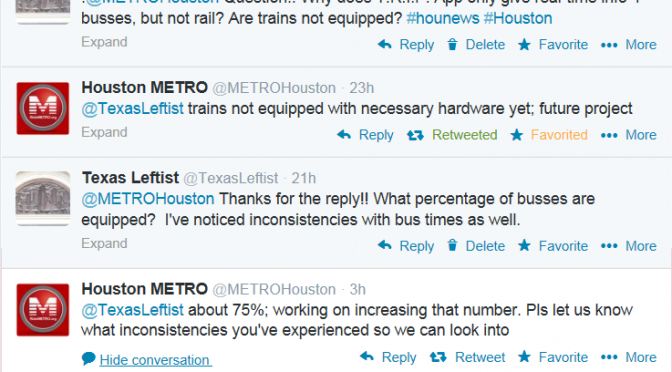 The Metropolitan Transit Authority of Harris County (abbreviated at METRO) has been working to address these higher expectations. Just last April, the agency unveiled the METRO T.R.I.P. app… a smart phone app that locates nearby transit routes, matches GPS technology in the smart phone and links it to GPS technology on the busses, and thus provides real- time arrival information for the next bus or train. As a result, this app potentially gives users more flexibility over their schedule, as they will know when to catch busses down to the minute. When working properly, the T.R.I.P. 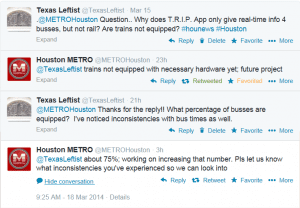 app represents a significant, potentially transformational upgrade in Houston’s transit operation. But any frequent user of the T.R.I.P. app can attest that it sometimes doesn’t work. I’ve used the app on several occasions where it says a bus is due, and the bus doesn’t show up for another 10 or even 20 minutes. This leads many to wonder if METRO’s busses and trains are all outfitted with the proper GPS technology. 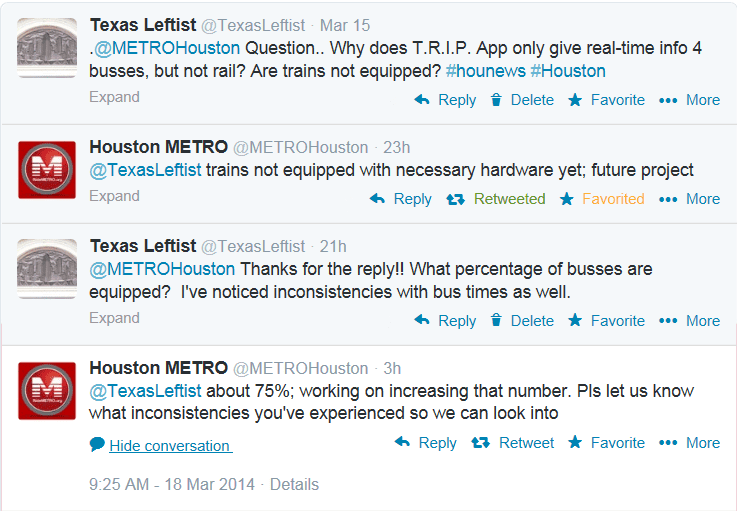 I decided to test the app over the course of a full week, using the METRO rail, and bus routes 42, 68, 81 and 82. First up were the 42 and 68 routes. Out of 20 total tests, the T.R.I.P. app successfully predicted bus arrivals 16 times, down to the minute. Both busses that seemed to be lacking the GPS technology were on the 42 route… all 68 busses were located. The 81 and 82 route was even more successful. Out of 20 total tests on that route, the T.R.I.P. worked properly 90 percent of the time, missing only 2 out of 20 busses. METRO rail however was a different matter. Out of 20 tests, the T.R.I.P. had 0 successful predictions for train times. No real-time information was even available. With the busses, it’s also important to note that these 4 routes are not necessarily a good indicator of service-wide accuracy, but meant to serve as a sample. So at this point, real-time arrival information isn’t available for all busses, and isn’t really helpful for train times. But nonetheless, it’s an important first step toward improving mass transit in Houston and providing commuters with alternative options to their cars. Hopefully they will work to get busses to 100 percent soon. If you are a frequent bus rider, try out the T.R.I.P. app and see how well it works for you. The Texas Progressive Alliance is ready to bust some brackets as it brings you this week’s roundup. Off the Kuff analyzes the primary performances of Wendy Davis and Bill White. 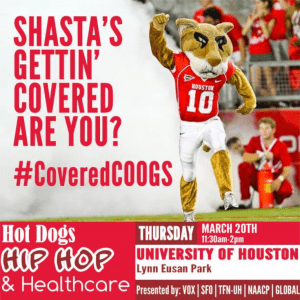 Horwitz at Texpatriate presents a novel idea to start getting students voting. 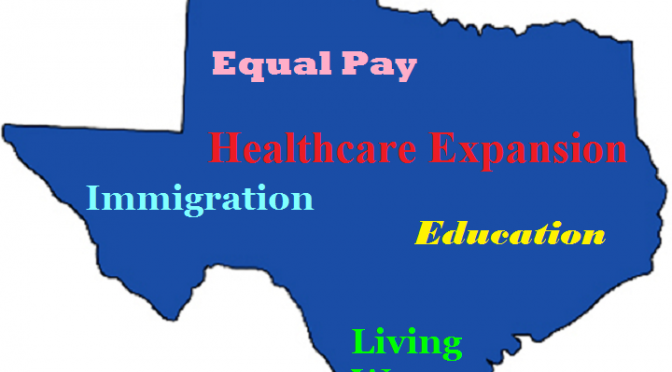 WCNews at Eye on Williamson once again points out Texas’ unfair tax system No One Is Offering An Alternative To The Raw Deal Texas Taxpayers Are Getting. Libby Shaw at Texas Kaos reminds Greg Abbott that no does not mean yes: Greg Abbott Tries to Spin No into Yes. Every opponent of the Affordable Care Act (Obamacare) should watch Daily Show’s Aasif Mandvi interview of Fox business commentator Todd Wilemon posted at EgbertoWillies.com. A Fort Bend Republican wrote an article for Houston Style magazine about “Democrat” Kesha Rogers. You can imagine how ridiculous that was. Well, no you can’t, because it’s even worse than you can imagine. PDiddie at Brains and Eggs called BS on it about five times. But nobody involved bothered to correct the record. Neil at All People Have Value said we should self-edit our lives in the same way that time has edited the works of the Ancient Greek poet Sappho. All People Have Value Is Part of NeilAquino.com. Cody Pogue calls the new abortion restrictions in Texas what they are – a threat to women’s health. Texas Redistricting charts our civic engagement crisis. Texas Watch wants private insurers to pay their fair share before any rate hikes are considered. Juanita predicts Tom DeLay’s next career move. Keep Austin Wonky advocates for using Austin’s budget surplus on universal pre-K.
Grits laments the “dystopic no-man’s land” created by the border fence. John Coby recaps the process of choosing an electricity provider. In The Pink explains what the movie “Frozen” is really about. I know I know… Say it Ain’t So!! Democratic Texas Congressman Joaquin Castro says he’ll boycott Buc-ee’s after the popular roadside megastore chain endorsed right-wing Republican Dan Patrick for lieutenant governor. “Won’t gas up there anymore since they support a fear mongering immigrant basher,” Castro, D-San Antonio, wrote on Twitter on Monday. “Wonder how Bucees patrons in Freeport, Lake Jackson stores feel abt their endrsmnt of DP who spoke abt immigrants bringing diseases to TX,” Castro added. Patrick was the top vote-getter in last Tuesday’s primary, and he is favored to defeat incumbent David Dewhurst in a runoff for the GOP nomination. The winner will face Democrat Leticia Van de Putte, who is Latina, in November. 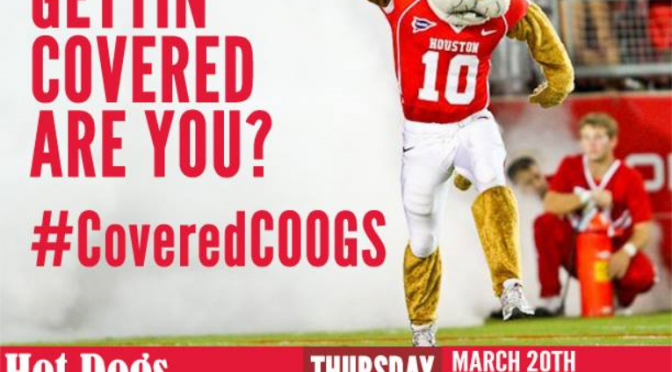 “To my great delight after our win Tuesday I got a call from the owners of Buc-cees who said they wanted to meet and support me,” Patrick wrote on Facebook on Sunday, above photos of himself with the chain’s beaver mascot and its two owners. Patrick once said immigrants are bringing “Third World diseases” to the U.S., and he recently called immigration from Mexico an “illegal invasion.” Patrick has challenged Congressman Castro’s brother, San Antonio Mayor Julian Castro, to a debate on the issue. Mayor Castro retweeted his brother’s tweet about Buc-ee’s on Monday. Buc-ee’s is quickly becoming one of Texas’ most beloved roadside institutions. It’s a must-stop for me any time I pass by one of the flagship stores. Even when I don’t buy a lot of stuff, I love to go in, rest my eyes from the road and just look at all of the quirky items they have on display. And of course, SUCH CLEAN BATHROOMS… I mean it boggles the mind!! 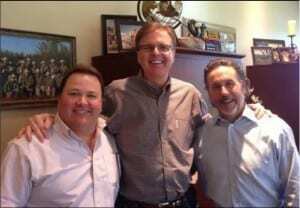 As much as one may love Buc-ee’s, Dan Patrick is reason enough to join Congressman Castro in the boycott. All the Beaver Nuggets in the world can’t make up for the terrible things Patrick says on an almost daily basis. It’s time to send a message to Arch “Beaver” Aplin III and Don Wasek (pictured below with Patrick in the middle) that everyone doesn’t agree with the State Senator’s views. And lest you think that the owners of Buc-ee’s are perhaps naïve of the political sphere, think again. Aplin ran for political office back in 1996 and is a proud Republican, so he knows what he’s getting into. Of course there’s nothing wrong with being a proud Republican, but Patrick’s anti-immigrant, anti-LGBT views are far too extreme. If you choose to join the boycott, you can also use Buc-ee’s online contact form to let them know why. Let’s find out how much they care about customer feedback.